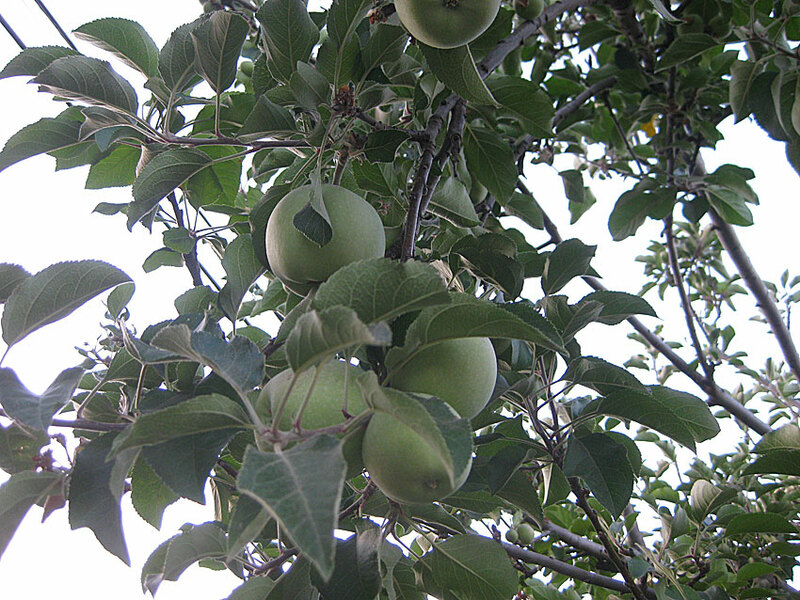 This is the first year that I we have large Fuji apples and it is all thanks to our bees. Of course, there are small apples as well, but many of the apples are larger than one might find in a grocery store. We still are fight the effects of the coding moth. This year, we set up traps, which has also help with the fight. I found a useful site, which I can assure you, that I will be using some of these methods next year. Last night, I started picking the apples. It is early, but the apples are still tasty at this stage in their life. 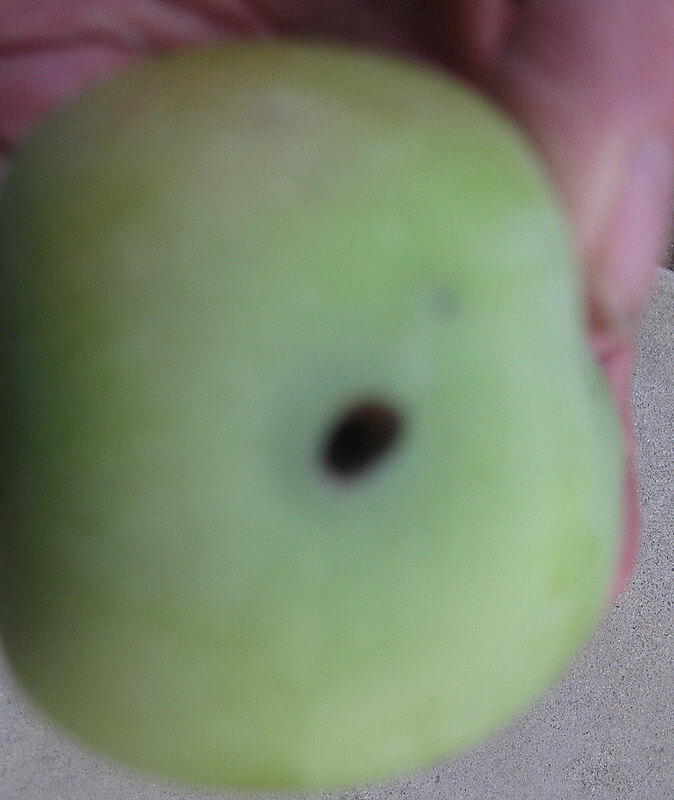 Not only do we have problems with the Coding Moth, but the squirrels find the apples tasty as well. The squirrels start going after the apples when the apples are young, and you can bet that their eyes get big, when they see those large apples. 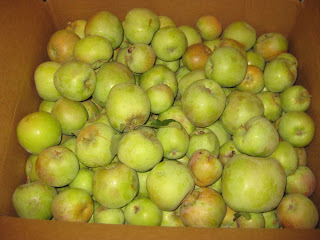 There are plenty apples for homemade apples sauce, which I use for several recipes, and especially when I just want to eat apple sauce. We use a lot of apples in baking, for use in pancakes, cakes, etc. 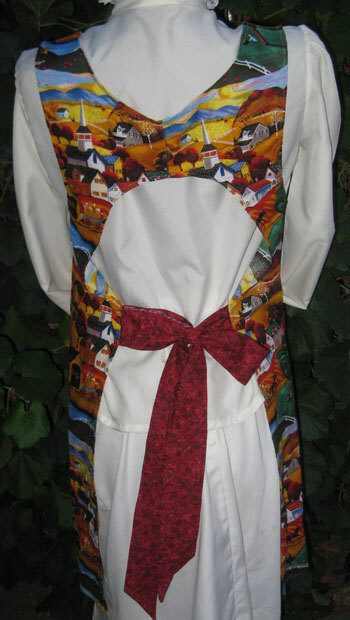 I just need to get out the tall ladder in order too reach those apples that are too high for me to reach. Now, I am not one to be on a ladder, as I have a fear of heights. Long story, but to sum it up, my brother saved my sister's life when he caught her by the hand and pulled up her up. She would not have had the life that she had, if it were not for our brother. californica roger's red grape. The thing about these grapes are that once the grapes have reached a certain size (before turning red), the grapes do not require water. 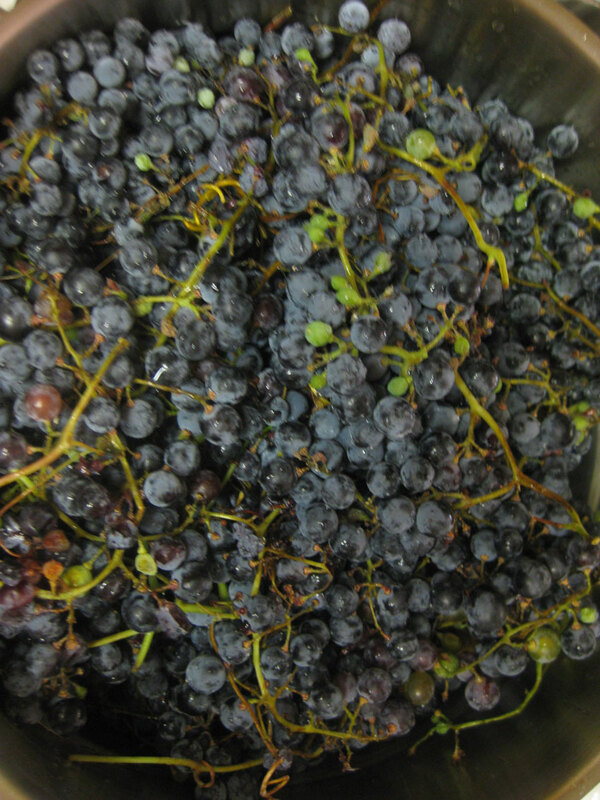 Not watering the grapes, creates a small, yet very sweet red grape. This year, we harvested 77 lbs. of Rodger's Red grapes. The first picking,we picked 18 lb. 9 oz., with a whopping 59 lbs. the second time around. 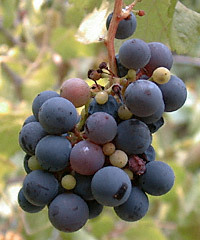 The Vitus californica grape is red through and through, but contains many small seeds. 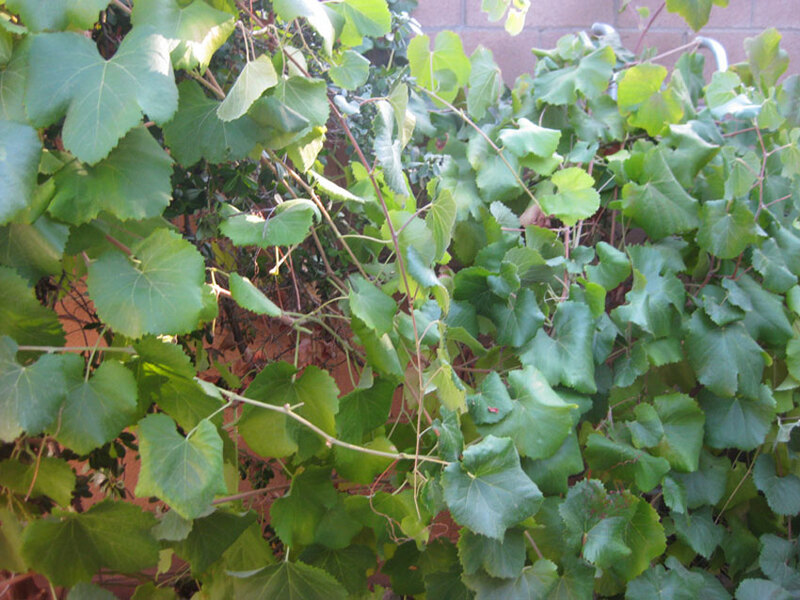 We decided to plant this grape plant years ago and the plant has proven year after year to be a huge producer of grapes. 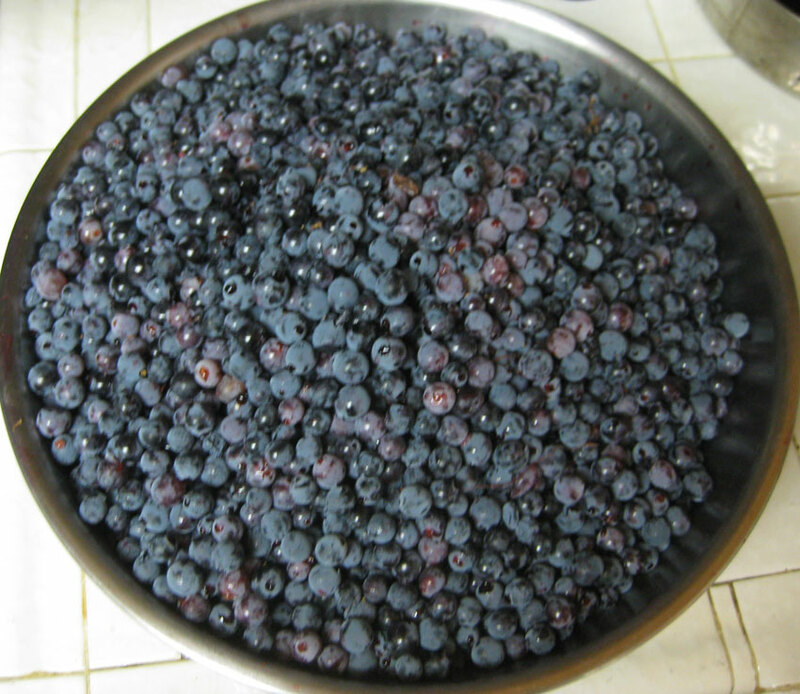 Each year, we harvest the crop and I make fresh grape juice and jelly. Each year, I try to find better ways to get as much juice out of these grapes as possible. 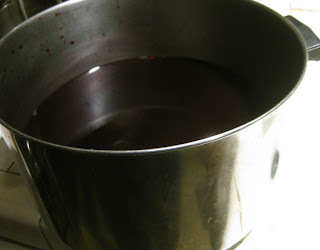 Last year, I found some information on juicing the grapes. The site suggested using a juicer like you would use for making carrot juice. The only problem was that I had to pluck off these tiny blueberry size grapes. 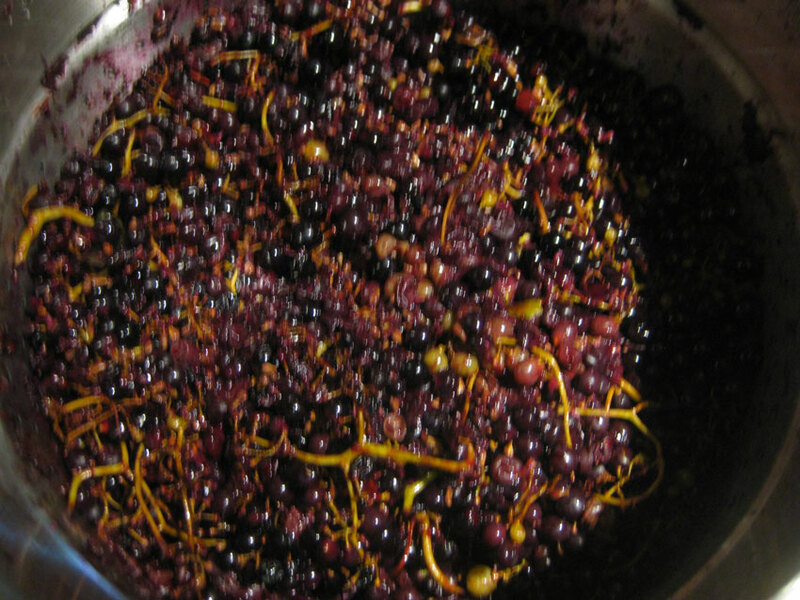 The juicer did get a lot of juice out of the grapes, but I was left with a mushy pulp mixture, still rich in juice. 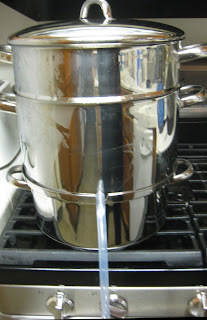 This year, I discovered the steam juice extractor. The nice thing is that I don't have to pluck off those grapes and I can put the whole stem along with the grapes in the steamer. This gives me some time to do other things. Problem is, it is over 100 here in California, so this limits the time that I can cook. I just don't want to heat up the house. The evenings are cooler (around 74 degrees). 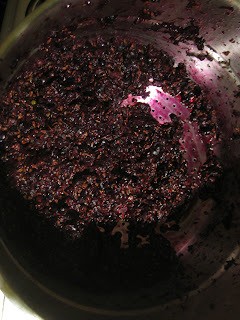 This image shows what the grapes look like after cooking for a while.The grapes needed a little of help from a potato masher. This type of grape is thick skinned. 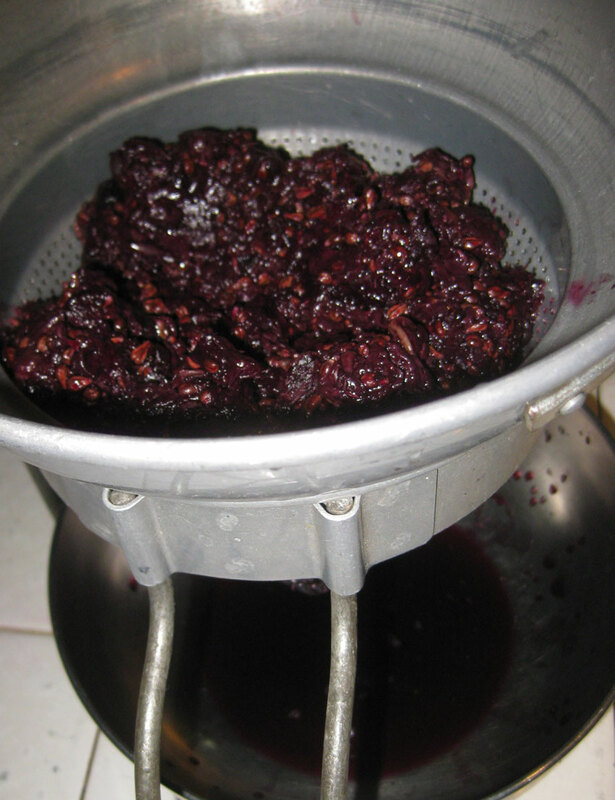 After using the steamer for the long after the recommended time, showing amount of juice, we used a potato masher, which helped to open up the grapes, thus releasing more of the fine juice trapped inside. Still hoping that this would be my solution, I was still stuck with the same mush at the end of the cooking. From research, it was discovered that some have pressed the grapes several times, which resulted in quite a bit of grape juice. I placed the remaining leftover seeds and pulp in a strainer like my mom used. I pulled out the stems, leaving me with just the seeds, pulp, and juice. All of the other batches produced more juice and less mush. I was able to use a potato masher at the end using the large top section of the steam juicer, instead of using the funnel strainer. Although there was still a lot of juice trapped in the pulp, I did manage to get a lot of juice out of the grapes using the strainer. 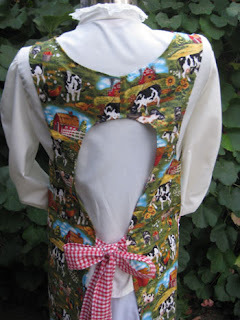 As I do each batch, I change how I do it. 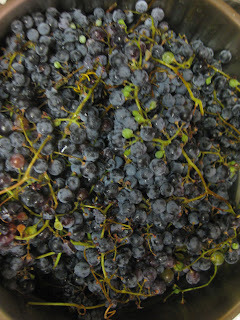 For example: If I do smaller batches, which by the way are just smaller than the recommended (it cooks faster), and fill the bottom half way instead of all the way too the top with water(with our stove, the water bubbles all over the stove) and use a potato masher while the grapes are at the end stage (instead of using the strainer), all is well. It is about the same amount that I got using the juice machine that I used last year, but I didn't have to pluck off all of those grapes, leaving me more time to do the things that I enjoy. Well, for the time being that is. I have about 8 plus batches to put in the steam juice extractor, and then comes making the homemade jelly, which is popular. 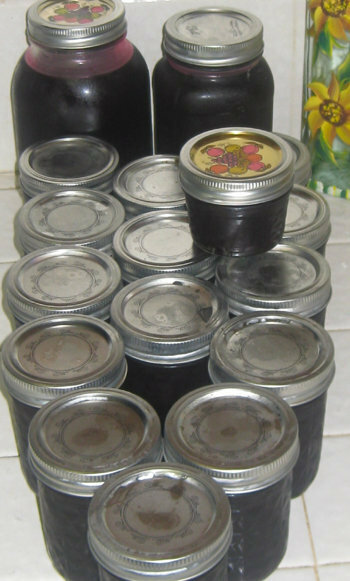 I have been told that the jelly made using these grapes, is better than the store brand. Even people who don't normally eat grape jelly, love the jelly. This year, we will have more jelly than we know what to do with. We do not have an arch, but the bush underneath the grape vines provides support. The grape vines provide shade and shelter for the underlying bush and since we don't water the grape vine during the summer months, we don't water the bush. This is saving us on our watering bill. 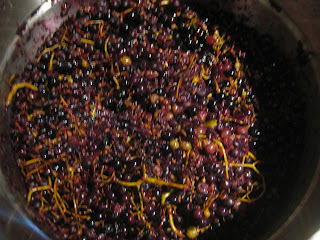 Although it is a challenge to get some of the grapes, with the underlying bushes, we still manage. 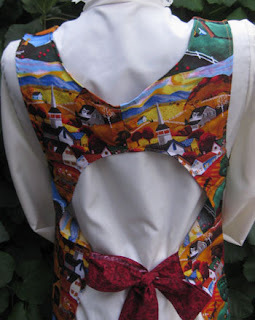 I truly like this vintage style apron. 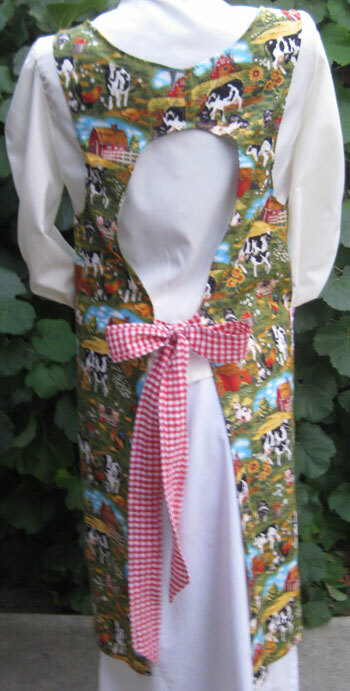 The vintage canning apron is perfect for protecting your clothes, whether you are working outdoors or prepare a favorite family meal. 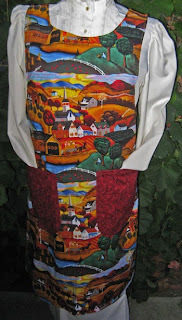 We have added 3 new canning aprons in size large. 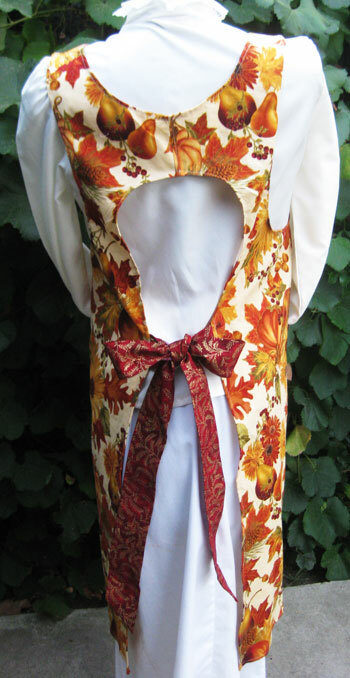 This gorgeous apron, has fall leaves, pumpkins, fruit, and flowers. The burgundy floral print goes so well with the colors in the apron. Down on the farm, is this lovely country theme canning apron. The red and white gingham print really adds an added touch of country. 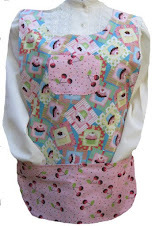 The pockets have a white ric-rac border. The colors come alive in this Fall country theme canning apron.